Let me write today about a very special company: “Project 7”. What makes them special is their mission, which is summarized in the company’s motto: “Products for good!”. Project 7 was founded in 2008 in the US and it is trying to make a difference in the world since then. They support 7 needs (health, environment, housing, hunger, thirst, education and peace) and the purchases of their products go directly to support one of them, by co-operating with different NGO and associations. More in particular, each purchase provides funds to projects evolving planting trees, provide shelter for those affected by natural disasters, provide meals, bring drinking water to those in need, deliver anti-malaria medications, give education to children in developing nations and support anti-bullying programs in US schools. The company has grown amazingly since 2008 and now they are present in many shops and department stores. Some of their retail partners are: American Airlines, Walgreens, Safeway, Sixflags,.. They have appeared in the news and articles extensively as well. 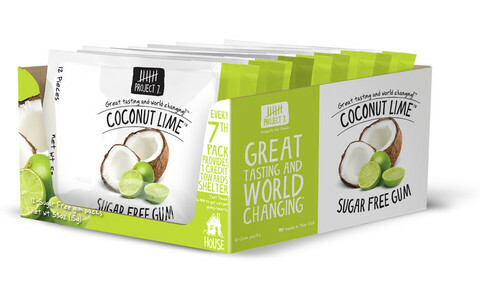 The offer contains gum and mints but here we are interested about their gum, which comes in six appealing flavors: Birthday cake, coconut lime, fresh & breezy, front porch lemonade, mint julep and peppermint vanilla. It has been awarded the “Most Innovative New Product” at the 2014 “Sweets & Snacks Expo” in Chicago.